Stardust Overdrive is a Booster Pack in the Yu-Gi-Oh! Official Card Game (OCG) and Yu-Gi-Oh! Trading Card Game (TCG). 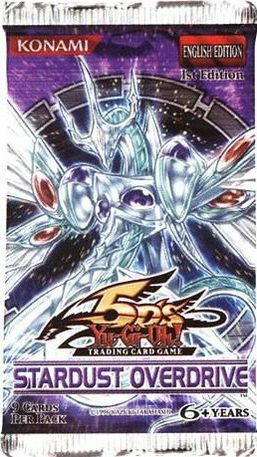 It is the sixth set of the OCG's 6th series after Ancient Prophecy. It is followed by Absolute Powerforce. The North American Sneak Peeks for this set took place from October 31-November 1, 2009. Packs of the TCG set were also printed in the Stardust Overdrive: Special Edition. Stardust Overdrive contains cards used by Yusei Fudo, Maximillion Pegasus, Crow Hogan, Luna, Kalin Kessler, Carly Carmine, Roman Goodwin, Misty Tredwell and Rex Goodwin. The TCG version also includes cards used by Rafael, Reggie MacKenzie, Alexis Rhodes, Bastion Misawa, Maximillion Pegasus and Yusuke Fujiwara. Introduces the new "Reptilianne" archetype, as well as the "Spider" and "Djinn of Rituals" series. TCG exclusives include new support for the "Koa'ki Meiru", "Lightsworn", "Fortune Lady", "Earthbound Immortal", "Reptilianne" and "Six Samurai" archetypes. A number of the cards included work with the Lord of the Magician/Spellcaster's Command and the Warrior's Strike/Warriors' Strike Structure Decks. This page was last edited on 13 March 2019, at 14:26.